Second Shot: Amazing Red Dot Quiz (9) - Where is this disused bridge in Singapore? 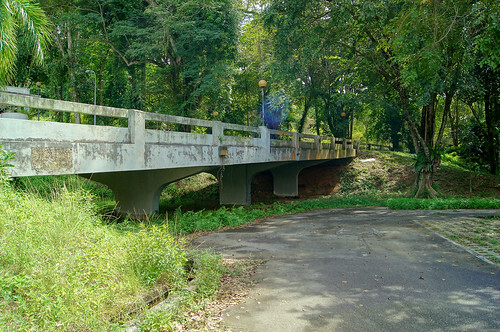 Amazing Red Dot Quiz (9) - Where is this disused bridge in Singapore? This post is published using Blogger scheduled posting feature. I have scheduled this to be published exactly on the dot, or rather on the tick of the clock at 12:00 am, 1 Jan 2011. As you read this, I may or may not be back in Singapore. For those celebrating the New Year overseas, I hope you had a wonderful time. I checked my hotel booking for 31 Dec 2010 and realized there is "free use of Internet with WiFi Connexion [sic]". Should I spam Facebook on the eve of New Year? My last post in 2010 was a dessert, something light to end the meal. Similarly we will begin 2011 with something light. What else but an appetizer to start the course? You know the rules. So where is this bridge in Singapore? The best clue is .... refer to the previous post. Alamak. The previous dessert already left us hungry and now you give us another can-look-cannot-eat appetizer. I think it is near the Sunset Way area. Chun See, it is not in the west. Andrew, you can. If you do, your answer will hold the key to the previous quiz, haha. The bridge, next to a disused football field, is at Turnhouse Road leading to the former SIA Sports Club. By the way, what's that bluish thing in the photo? flare? Andrew, not paranormal for sure, haha. must be flare or camera problem. My answer correct for the previous quiz? Won't post my guess there, maybe there's others still guessing.